Doncaster Knights’ record points scorer Dougie Flockhart is facing another lengthy spell on the sidelines. The goal-kicking Scot is thought to have torn his bicep in Saturday’s 57-14 Championship defeat against second-placed Ealing at Vallis Way. Out for over three months through a similar injury to his other arm two seasons ago, Flockhart was playing only his second game of an injury-hit season. “Dougie is gutted and could be out for the season,” said director of rugby Clive Griffiths yesterday. The club will also be checking on the extent of Charlie Foley’s first-half shoulder injury this week. Although second-rower Matt Challinor was able to return after a first-half head injury assessment (HIA) he suffered a broken nose in the incident. 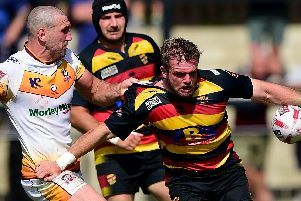 “We’ll be checking Chally during the week ahead of Saturday’s game against Bristol to make sure there no delayed reaction,” said Griffiths, whose squad was down to the bare bones at Ealing. Veteran prop Richard List was ruled out with a neck injury and fellow front-rower Colin Quigley (thumb) was named on the bench in order to make up the squad but was never going to be called upon during the game. Griffiths, who also lacked another half-dozen players including Aaron Carpenter, Andy Bulumakua, Tom Hicks and star full-back Paul Jarvis who has yet to play this season, also decided against playing strong-running centre Will Owen over fears that Ealing’s artificial pitch would further aggravate his knee injury. “The galling thing is that everything they threw at us we’d prepared and planned for but you can’t legislate for individual errors or people taking the wrong options. Centre Mat Clark proved his fitness on Saturday, following a freak training accident in May, by playing a full game for Hull Ionians. Clark, who played 40 minutes playing for Blackheath recently, scored two tries for the National One side and will come into contention for the Bristol game.